Payment Terms: Payment terms are within Discount Marketing Products, Inc. sole discretion and unless otherwise agreed to by Discount Marketing Products, Inc. Net 15 days will be applied to all orders commencing from the ship date. Payment for product may be made by check, credit card or wire transfer. Shipping is not included in the price of the product. Discount Marketing Products, Inc. may invoice parts of an order separately, including shipping. Tax: All prices quoted exclude GA sales tax (where applicable) and shipping/handling charges. Artwork: Additional artwork setup charges will apply to every order unless agreed upon by a company representative. All necessary liability, event and/or other insurance is the sole responsibility of the purchaser. Shipping Charge: Taxes/Title/Risk of loss shipping and handling are additional unless otherwise expressly indicated at the time of sale. If you believe any part of your purchase is missing, wrong or damaged, you must notify Discount Marketing Products, Inc. within two (2) days after receipt of your order. Delivery/Shipping: Delivery/shipping dates are given to be used as a guide only. Discount Marketing Products, Inc. will not be held responsible for any loss of earnings or consequential damage as a result of delivery delay. Unless otherwise specified domestic shipping is not included in the price. Warranty: Discount Marketing Products, Inc. has sole and absolute discretion as to whether the defective product will be replaced or repaired. Any claims for replacement or repair of products shall be made in writing. Banners will be replaced only if there are clear manufacturing defects present on the hardware and/or the material sleeve. Any issues must be documented and made known to Discount Marketing Products, Inc. within seven (7) days of delivery. The banner unit (sleeve, poles and bag) is not covered for damages caused by misuse or weather. 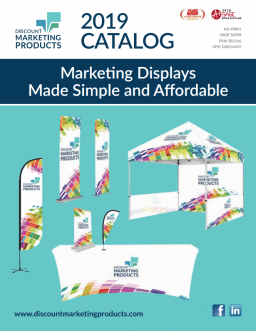 In the case of a banner being damaged, we will require the damaged item be returned to Discount Marketing Products, Inc. at the client’s expense for a detailed inspection. Should the sleeve tear for any reason then the client can return the sleeve and Discount Marketing Products, Inc. will have it repaired, if possible at a cost to the client. If the component is damage as a result of a clear manufacturing defect then Discount Marketing Products, Inc. will gladly replace the damaged banner component at our expense. If Discount Marketing Products, Inc. determines that the damage was caused by negligence and/or misuse then Discount Marketing Products, Inc. will either repair the item at the client’s expense and/or order another component at the client’s expense. Fading: The banner material sleeve colors are printed using a full-color digital dye sublimation process and should resist fading for one (1) year warranty from ship date. Any claims for fading shall be made in writing. These shall be submitted to Discount Marketing Products, Inc. within twelve (12) months of invoice date. Return Policy: All goods or replacement goods returned to Discount Marketing Products, Inc. for repair or replacement under warranty or work undertaken at the purchaser’s request and at his/her cost, must be returned in a clean and dry condition and properly packaged. All returns must be accompanied by a return authorization (RA) number issued by Discount Marketing Products, Inc. Discount Marketing Products, Inc. reserves the right to refuse any unit not returned in a clean and dry condition, or without a return authorization. To obtain an RA number, please contact your sales representative. Copyright: All drawings, renderings and designs prepared by Discount Marketing Products, Inc. remain the property of Discount Marketing Products, Inc. and may not be reproduced in any manner without written permission. The customer binds him/herself to indemnify Discount Marketing Products, Inc. in accordance with supplied specification and, therewith, infringing upon the rights on any person(s). Sizing: Sizing is given as a guide only and due to the nature of the business, it is not an exact science. Sizing may vary slightly depending on the product ordered. Products may be manufactured in-house or outsourced locally and/or internationally.